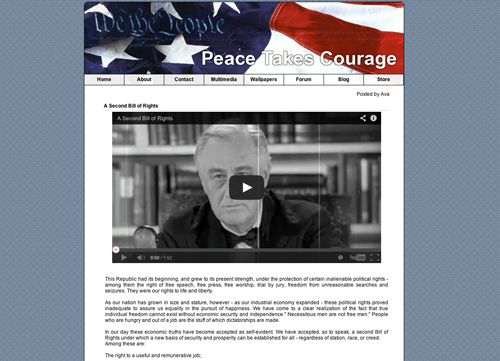 Launched as a political multimedia website in 2005 by then 15 year old Ava Lowrey, PeaceTakesCourage.com has received an amazing amount of attention. Ava’s videos gained attention by showing multidimensional tragedy of the Iraq war – losses of brave young soldiers to American families, and loss of innocent civilians in Iraq. Poignant and raw, Ava’s youth and sincerity attracted support from a broad base of both soldiers and activists. But her unflappable determination drew its share of persecution, as well. Ava received death threats from angry Bush and Iraq War supporters. But Ava also received strong support from friends in the blog world, and received a warm welcome at the highly successful Yearlykos Convention (now known as Netroots Nation). These and many more friends have helped Ava’s videos receive media acclaim (NYT, CNN, The Rolling Stone, Mother Jones Magazine, Huffington Post, etc…) and reach an unbelievable audience of Americans who are eager to learn the truth about the Iraq War. Additionally, she directed a feature length documentary profiling three Veterans of the War in Iraq during her senior year of highschool, released in 2009.